Canon Steve was born in the city of Portsmouth, and is one of a twin, not identical though; as he has a sister, together they were the first set of twins to be born at St. Mary's General Hospital in Portsmouth at Christmas time for 21 years in 1971. During his young life he attended St. Mary's Church, Portsea, now the area of Fratton. Where he was in the choir in the early 80's. At this time St. Mary's Church was High Anglican (Anglo-Catholic). His self discovery in his late teens was truly within the Catholic faith and so attended various Catholic Churches. But settled at Our Lady of Loudres Eastney in Portsmouth where he became an experienced altar server and later sacristan on returning from university. He later approached the Church for ordination, but was turned away on account of his young age and not having enough experience of the world. Thus he embarked on a career within the civil service. The year 2007 was the most testing year ever in Steve's life and of all his family, it was to be a test of love, endurance, courage, faith and acceptance of what will be a lasting testament to all those things that bind us together and forever. His Step-Father was diagnosed in January 2007 with metastatic lung cancer, his prognosis was 5-9 months. He survived 5 months and passed away in May 2007. Steve was diagnosed with Hodgkins Lymphoma, stage 4 of the disease in April 2007, from a tumour taken from his left armpit. The prognosis was poor however and he was told he had 3 months to live. Steve had tumours on every organ, lumber of the spine, back of the stomach. He embarked on a heavy regime of chemopherapy called ABVD for the next 9 months. The treatment was successful. However, it later returned in his neck in 2010. The next course of treatment was to have been 12 sessions of radiotherapy, however this next course of treatment did not happen. Steve embarked on a 6 week prayer novena to St. Peregrine, patron saint of cancer patients. For whatever reason, the tumour diminished and the onocologist was surprised. So for now he is grateful for the powerful prayer and intercessions made to St. Peregrine. "After a life changing event such as cancer, things that mattered before aren't so important any more", he said. After much post treatment care and support, Steve discerned the calling to the priesthood, although he had done this for most of his life, but the time was never right. It has to be on God's time and not ours. Two years after post cancer treatment and support and now equipped with discernment, Steve approached one Church, ordained into the Diaconate ministry in February 2012. As time went on, this particular Church wasn't for him as it lacked the basic Catholicity and structure. In late 2012 Steve made contact with TESSAC for possible consideration for incardination. After checks were made, Steve was duly accepted and admitted into the Society. The Superior General Martyn Douglas, then made plans for Steve's ordination as priest in February 2013. His orders were then appropriately regularised. 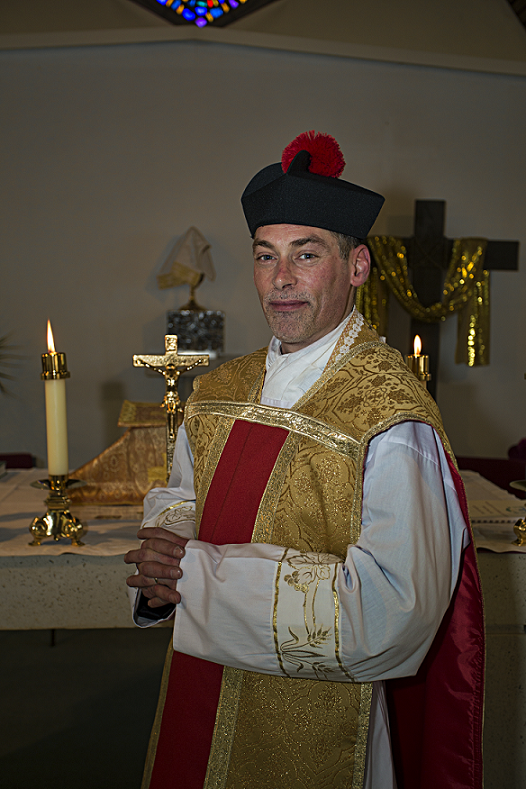 Later Steve was elevated to Canon and recently during our spring retreat 2016, he was made our new vicar general.